My love of photography started over fifty-five years ago when my parents presented me with an Argus C3. Everything I shot always had mixed results until about twenty-five years ago when I started taking photography classes. This made a huge difference in accelerating my understanding of the medium and provided a lot more enjoyment to whatever I was shooting. 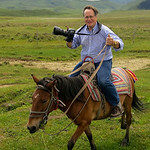 For the past fifteen or so years, I have been very fortunate to have traveled extensively, for work and pleasure, to many distant places, always with camera gear in tow. As you can tell, horsemanship is not my strong suit. As a matter of fact shortly after Mark made this click the horse stumbled and off I went. A second of startle then a lot of laughter. And, yes, the camera never touched the ground.